Astronautentraining / Schwerelosigkeit für Alle !!! Mission Briefing: Ihr erster Schritt ins All! Anweisungen und nehmen über Intercom Kontakt zu Ihrem Piloten auf. Sie das Gefühl der Mercury - Astronauten der frühen 1960er Jahre hautnah erleben. Wenn erforderlich wird nochmals Ihr persönliches Experiment durchgecheckt und schon geht es los! Überprüfung des Luftraumes starten die eigentliche Mission! dies aber relativ leicht zu bewältigen. Mercury Astronauten bei Start und Wiedereintritt in die Erdatmosphäre. Das Ganze wiederholt sich 10 - 12 Mal, also insgesamt mehr als 2 Minuten Schwerelosigkeit für Sie! Wir freuen uns schon sehr, mit Ihnen in die Schwerelosigkeit starten zu dürfen! Weltweit das erste Praxisprojekt für Parabelflüge mit Segelflugzeugen! Der Preis für Ihre Mission: 420,00 Euro, incl. Tax. Das Fluggerät, ...your first step into space... - sara / mercury ! Since 2002 parabolic flights have been successfully flown with paying passengers. A CASA 212, a SHORT SC7, a CESSNA GRAND CARAVAN and a LET 410 have been in operation. All aircrafts are equipped with 2 turboprop motors each and provide a very spacious passenger area which allows 20 passengers or the equivalent amount of space for cargo. In the configur at a parabolic flight 4 (zeroG) respectively 5 (moon/marsG) passengers are carried at the maximum. Additionally there is one instructor and as a rule two operative cameraman with fastened seat belts. The aircrafts are equipped with the absolut necesseries, allouwing passengers free movement. Exposed areas are fitted with the respective safety protectors, ensuring that passengers remain free of inquries. After a series of tests and trainings the aircraft are chartered including staff and technicians for the parabolic flights on a short term base. have led to massive disturbances of our business operations. Firstly there are the official requirements which have been fulfilled by us in the forefront. Since March 2005 a reconstruction of the engines is demanded which exceeds our financial potentials and possibilities by far. 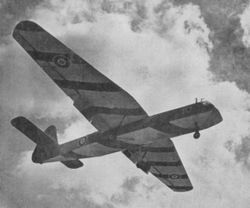 and application of a TRANSPORT GLIDER. 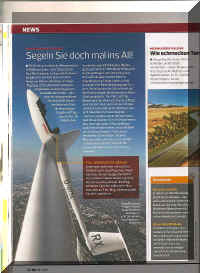 It will be the worlds very first CIVIL USE TRANSPORT GLIDER! Despite the tremendous interest of the audience, the media potency and the demand for such research establishments at present, a continuation of the parabolic flights in Europe seems extremely doubtful almost practically impossible due to the two stated reasons. 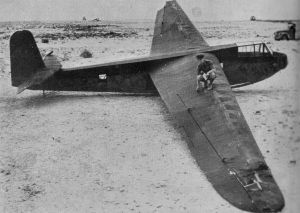 of the first ZERO G TRANSPORT GLIDER. Preliminary an extensive and professional investigation has to be carried out to ensure that an adequate partners – a Glider manufakture-company and a finance partner- will be found and at the same time the certification of the aircraft at the concerned European Authority for the operation within the European Union is warranted. Those divisions that have optimally proved themselves – as described before – should remain unchanged. The launching and landing pads which have been widespread over Germany, Slovakia and Austria so far – depending on the availability of the used aircraft – should be centralised for economic and practical reasons. Thus from one fixed starting pad for example Vienna, Linz or Salzburg – right from the centre of Europe – a permanent, cost efficient and straightforward access to zero gravity can be ensured to all international research establishments! Marketing activities with flights for the public and access to the media would be garanteed furthermore and therefore also the economic operation be secured. The involvement of Universities and public schools which can be granted free access to experimental zero gravity through ideas competitions is just one more example for an respectable and effective public relations overall concept. From the previous experiences another positive effect could be observed: having experienced the unique feeling of zero gravity themselves the passengers understanding for future space flight missions has tremendously grown. Furthermore in the position as tax-payer the people´s attitude towards upcoming spaceflight missions of ESA as well as towards space travel in general was much more open minded. In the same way the echo of the media was enormous, the numerous reports and press coverage showed a very broad acceptance of our activities. The TV moderators and journalists that had attended a parabolic flight reported throughout exceedingly positive about their trial lesson in space flight. Since the first test flight on 14.04.2002 30 parabolic missions have been flown so far with a total of 531 single ZERO G parables of approx. 10 sec. each. Thereby we remain at a total experience of 1,5 hours of weightlessness at present. For comparison: One earth circulation with a space craft in a lower orbit takes approximately as long. Thus more than 100 passengers were able to enjoy zero gravity, up until today not a single even minor injury has occurred, whether for passengers or cabin crew. In total a number of 4 different aircraft types have been used, in none of the cases there has been any kind of disturbance with the aircraft body, the steering or engines. Additionally to this practical expert knowledge a great deal of experience in the administrative field comes along which implies activities from the marketing, internet presence, dealing with the bookings, media work, to the acquaintance with Authorities and the operating Companies of the Aircrafts. As an Austrian company, pauls parabelflüge was the first private supplier worldwide who offered parabolic flights, since September 2004 the ZeroG-Corporation offers parabolic flights for the public with a rented Boeing 727-200 in the USA. Other – but non private providers are the NASA with KC 135, ESA (NOVESPACE) with Airbus A 300 and ROSKOSMOS with IL 76. At the ticket price pauls parabelflüge is by far and with a great distance the absolute cheapest supplier and in Europe still the only private company in this sector. ESA has contacted us already with the interest to fly public missions in their name, further to create Mars and Moon gravities as simulations for projected future manned missions to the stated orbits to therefore be able and carry out first trials for such missions. Due to the media echo the public´s interest is already higher than expected at this early stage and it can - if the flights are reliably offered even be more increased. Our previous customers come from all over Europe, the proportion of foreigners averages to far above 50 %. Booking procedure, mail order, information, product presentation are carried out almost entirely through the internet. Mainly due to the economical assignment of the aircraft and the tight company structure pauls parabelflüge is able to offer tickets profitable at approx. only 20 % to 30 % of the competitors selling price. Moreover as we are the only private supplier in Europe an upswing on the international platform can be expected when continuing with our activities. At standard missions for ZERO G / weightlessness the total of 20 parables will be flown with 12 to 15 seconds of weightlessness each. Aprox 4 minutes, 20 seconds at mission. Furthermore the parables could be flown significantly plainer, ideal for extended experiments andfield studies in weightlessness. To keep the energy budget and the height loss as low as possible in every single mission 4 consecutive segments of 5 parables each are flown. 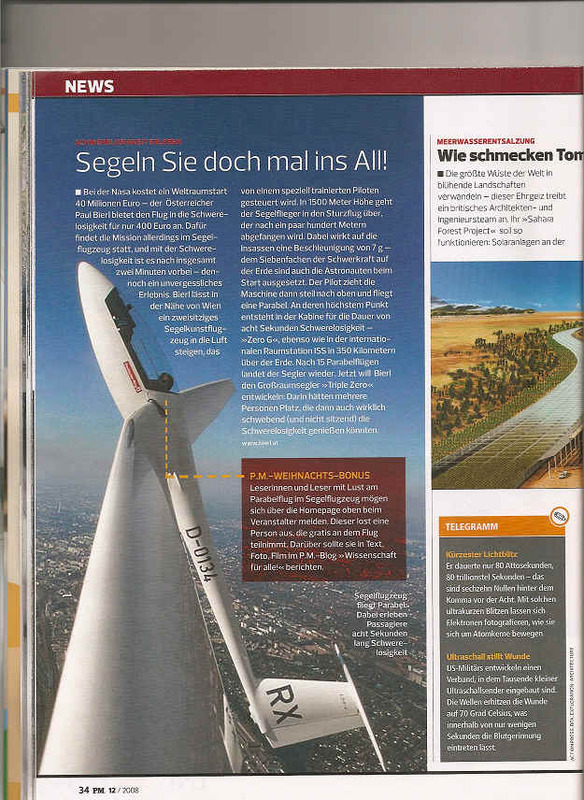 The parabolic flights with the Transport Glider will start in a height of 10.000ft sea level and stop at 4.000ft. Further optimised flight profiles for various experiments are possible anytime. Furthermore the parables can be flown more precise due to the higher performance of the aircraft which is ideal for expanded experiments and field works in weightlessness. Moreover the setup of a steady base is aspired from where the customer service, the entire administration for the offered parabolic flights and an extensive, practical and therefore effective marketing is carried out. In the same way continuative research / investigation for alternatives of weightlessness within the earth´s atmosphere. Towing: Pilatus PC6, AT-802 Powerplant: PT6 with aprox 1.000 kw……. Aufgrund der in Europa und speziell innerhalb der EU neu geltenden sehr restriktiven Gesetze und Verordnungen im Zusammenhang mit der Beförderung von Passagieren in Luftfahrzeugen, sehen wir nun keine Möglichkeit mehr, in absehbarer Zeit unsere bisher erfolgreichen und begehrten Parabelflüge in dieser Form, innerhalb Europas, weiter anzubieten. Bis wir wieder hier in Europa oder in der Nähe starten können, können wir vorläufig nur Flüge in Amerika anbieten. Für USD 4.200,-- (ca. € 3.570,--) in die Schwerelosigkeit! Von uns schon vorab getestet, bietet die Boeing 727-200 bis zu 30 Sekunden Schwerelosigkeit am Stück! Dazu, quasi zum Aufwärmen am Beginn des Fluges 2x Mars und 3x Mondschwerkraft. Buchungen ab sofort, für nähere Infos stehen wir gerne zur Verfügung. Reise und Aufenthalt sind im Ticketpreis nicht enthalten. Gerne organisieren wir auch Ihre komplette Reise mit deutschsprachiger Betreuung und Rahmenprogramm. Besuch des Kennedy Space Centers, diverse Flugzeugmuseen, usw. PARABOLIC FLIGHTS are being flown consciously since the forties of the last century. Their intended purpose is the creation of zero gravity which arises inside the aircraft while flying parabolic. This zero gravity is no simulation – physically speaking it is the same weightlessness that happens inside a spacecraft for example. To this day this is the only possibility – within the earth´s atmosphere – to create zero gravity on a noteworthy level. Thus parabolic flights are mainly used for training astronauts, tests on instruments and experiments in zero gravity. The profile of the aeroplanes flight path is hereby comparable with the flight path of a stone, thrown in the air at an angle of 45°. as well as to provide interested private individuals a simple and cost-saving possibility to experience zero gravity first hand. Since 2002 parabolic flights are successfully flown with paying passengers. Presently there are one CASA 212 and one SHORT SC7 in operation. Both aircrafts are equipped with 2 turboprop motors each and provide a very spacious passenger area – for this aircraft types – which allows at normal case 20 passengers or the equivalent amount of space for cargo. . In the configuration parabolic flight 4 (zeroG) respectively 5 (moon/marsG) passengers are carried at the maximum. Additionally there is one instructor and as a rule two operative cameraman with fastened seat belts. The passenger are is being cleared except for what is absolutely necessary to be able to offer enough room for floating. Exposed areas are fitted with the respective safety protectors for the safeguarding of the passengers. After copious tests and trainings the aircraft is being chartered including staff and technicians for the parabolic flights on a short term base.